Meredith Pinckney, a Wake County middle school teacher, said excessive testing harms students. That’s how Wake County teacher Meredith Pinckney said some students reacted after learning they’d performed poorly on end-of-grade tests last year. 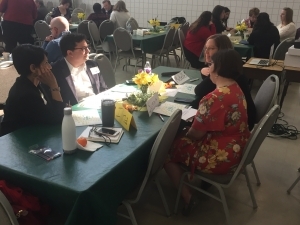 Pinckney was one of several dozen teachers who attended a “community conversation” Saturday to discuss the impact excessive testing has on students and teachers. 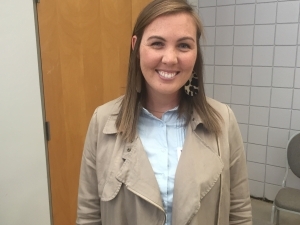 She spoke candidly with N.C. Policy Watch about how some students reacted last year after receiving their scores on state end-of-grade tests. In North Carolina, scoring Level 1 on end-of-grade tests shows a student has limited command of the subject area, while a Level 2 shows partial command. Levels 3, 4 and 5 show sufficient, solid and superior command of subjects respectively. Pinckney teaches middle school agriculture and biotechnology, an elective, so students don’t take end-of-grade tests in the subjects she teaches. But as a test administrator, she sees first-hand how standardized tests impact students and teachers. “In the weeks leading up to the testing, you feel the tension in the building just rising and rising and rising, then it’s finally test day and we do that and it’s over and you would think we’d feel better, but then we get test scores,” Pinckney said. Teachers from across the state attended a community conversation to discuss the impact excessive testing has on teachers and students. Dane West, a middle schools social studies teacher from Lee County also attended the community conversation on excessive testing. West said testing “weighs” heavily on students. Both Pinckney and West are realist when it comes to testing. They acknowledge that some testing is needed, but agree steps can be taken to streamline it and to reduce student and teacher anxiety. He said students’ mental health is harmed by the pressure of excessive testing. “I know the mental health of my students is more important than the numbers that they get on those tests, and right now it’s affecting their mental health,” West said. Pinckney said there is “value” in testing students, but the state’s needs to rethink how it’s done. The community conversation was hosted by N.C. Families for School Testing Reform (NCFSTR), Save our Schools NC and Jen Mangrum, a candidate for State Superintendent of Public Instruction. Noted educational policy analyst Diane Ravitch weighed in via Skype. Ravitch said federal and state leaders have given too much weight to standardized tests. She said such tests are often flawed and shouldn’t be used to measure student and teacher success. 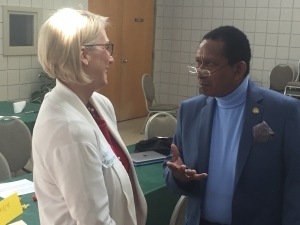 Jen Mangrum, (Left) a UNC-Greensboro education professor who is running for State Superintendent, chats with State Sen. Floyd McKissick (Right), a Democrat who represents Durham, during Saturday’s community conversation. Yet another example on why NC Testing is warped. The media should dig deeper into the testing issue. All sort of angles to investigate. So much more than Mark Johnson’s simplistic “too much testing” campaign.